A 10-year-old Warmblood gelding used for Intermediate Level dressage was referred for evaluation of a chronic intermittent right front (RF) lameness, which had become acutely exacerbated following a recent competition. The lameness failed to improve despite two weeks of rest together with a course of oral phenylbutazone. Upon presentation, the horse was bright and alert. Physical examination revealed no abnormalities. Lameness examination in-hand revealed a 2+/-3 out of 5 (0= sound; 5= non-weight bearing) RF lameness. The degree of lameness was partially improved following a palmar digital nerve block and was completely abolished following an abaxial (basisesamoid) nerve block. Radiographs of the foot and pastern were obtained, which failed to reveal any abnormalities. An ultrasound of the foot and pastern was performed, which was inconclusive. Based on the horse’s history and the results of our examination, he was admitted to our hospital for MRI examination of the foot and pastern. Please review the video loop of the MRI examination and give your diagnosis, then continue below for the answer. Lateral is to the right side of the image. 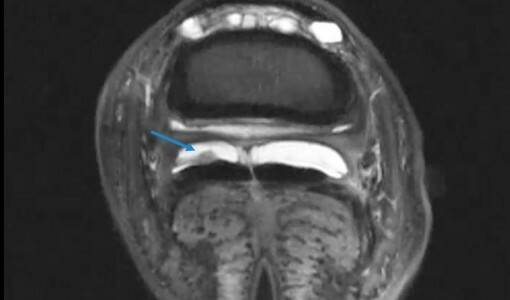 The MRI revealed effusion of the navicular bursa together with an irregular medial lobe of the deep digital flexor tendon (DDFT) characterized by an irregular dorsal border, mild tendon fibrillation with hyperintense tissue (when compared to the DDFT) covering the dorsal surface of the medial lobe of the tendon and radiating towards the medial wall of the navicular bursa. Based on the MRI findings, exploratory navicular bursoscopy was performed. Bursoscopy revealed a soft tissue mass characterized by granulation-like tissue covering a focal tendon tear affecting the dorsal aspect of the medial lobe of the DDFT. The mass and dorsal tendon border were debrided using manual and mechanical instrumentation. Post-operatively the horse was shod with an aluminum egg bar shoe with a four-degree rim wedge pad made of plastic and leather. The horse began walking exercise 72 hours post-surgery. Recheck examinations were performed every eight weeks with gradual progression in the level of exercise. Six months following surgery, the horse was able to return to his previous level of competition successfully. Endoscopy of the navicular bursa (navicular bursoscopy) was originally described as a preferred alternative to the traditional “street nail” procedure in cases of foreign body penetration of the navicular bursa through the frog1. This technique revolutionized the way equine surgeons approached this region as well as greatly improving its prognosis for return to athletic soundness. More recently, navicular bursoscopy has been described as a method of diagnosing and treating lesions within the navicular bursa, including lesions in the deep digital flexor tendon, the collateral sesamoidean ligament, the impar ligament, and the flexor surface of the navicular bone2-4. In their report, Smith and colleagues (2007) found approximately 70% of the horses suffering from DDFT lesions and erosions to the flexor surface of the navicular bone returned to their previous level of soundness following endoscopic debridement of the lesions2. Recently, Smith and Wright (2012) reported on the management and outcome of 92 cases that underwent navicular bursoscopy for the management of conditions such as DDFT lesions and similarly found that 61% of the horses returned to work sound with 42% returning to their previous level of performance5. At our hospital, we have observed a similar outcome when using bursoscopy in these cases, either alone or in combination with other therapeutic modalities such as intra-lesional therapy with PRP or stem cells. Similar to other reports2,5, in our experience, the presence of lesions of the DDFT concurrently with erosions/degeneration of the flexor surface of the navicular bone carry a worse prognosis to return to the previous level of soundness than when the flexor surface of the navicular bone is not involved6. Prior to considering navicular bursoscopy, it is imperative that the lesion(s) be adequately identified in order to design an optimal surgical and post-surgical plan to be discussed with the owner and trainer ahead of time. 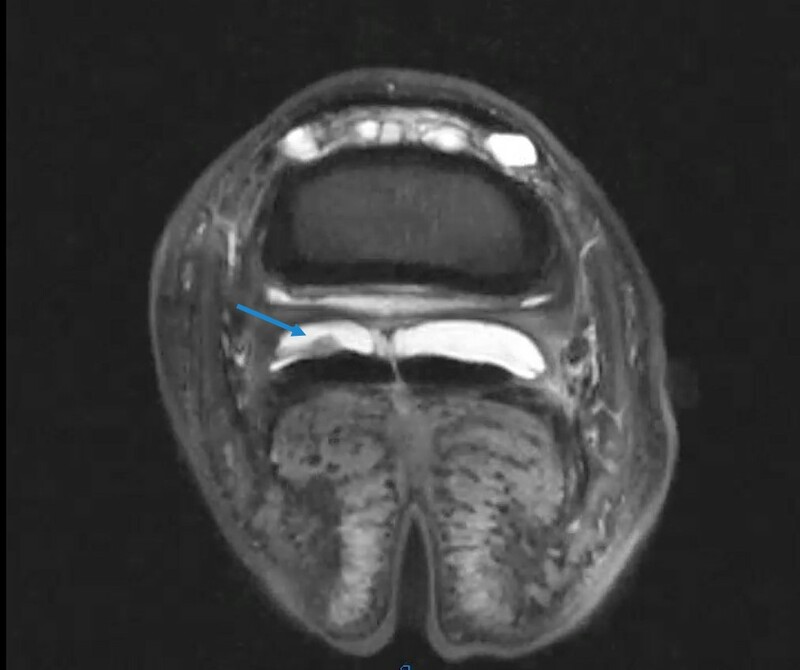 For this reason, MRI of the affected foot (feet) is typically done at our hospital in horses with conditions localized to the foot and where involvement of the navicular bursa is strongly suspected. Following the MRI, an ultrasound is performed (even if one was done prior to the MRI) in order to accurately “map” the lesion sonographically and establish a baseline for the follow up ultrasound examinations. Navicular bursoscopy can be done with the patient in lateral or dorsal recumbency, although this author prefers lateral recumbency. In order to reduce bleeding, a tourniquet can be applied to the mid third metacarpal (tarsal) bone. Based on the location of the lesion, the surgical approach can be done using a traditional1,3 or transthecal approach2. In our hospital when using a traditional approach, in order to avoid penetration of the palmar (plantar) pouch of the DIP joint, distension of the bursa is achieved either under fluoroscopic or digital radiographic guidance using radio-opaque contrast material diluted to a 25% strength with sterile saline. Once in the bursa, a combination of motorized synovial resectors and rongeurs are used to debride the lesion(s) effectively. Following adequate debridement, the bursa is thoroughly lavaged, the skin incisions are sutured in a routine fashion and four milliliters of Polyglycan® is injected into the bursa. To try to reduce the load of the DDFT onto the navicular bone, an egg bar shoe with a four- to five-degree wedge pad is applied to the foot immediately following surgery. Physical therapy in the form of hand-walking exercise is initiated 72 hours following surgery in order to minimize adhesion formation and re-introduce normal gliding to the tendon. A typical case will begin hand-walking exercise five minutes a day with five-minute increments every week until reaching 25-30 minutes, at which time walking exercise under saddle followed by trot work is instituted. The navicular bursa is typically injected with Polyglycan® (2.5 mls) two and six weeks following surgery. In cases where either articular erosions or significant inflammation/edema are identified, the horse is treated with Tildren® given once intravenously (500 mg) either immediately before or following surgery, and again four months later. As the horse re-enters more active controlled exercise, the degree of the heel wedge is reduced by one degree (usually every five to six weeks) until reaching two degrees. Other treatments include the use of IM Adequan® (500 mg [one vial] given IM once every four days for seven treatments) or oral nutraceuticals. Follow-up examinations including ultrasound examinations are typically performed every six to eight weeks. Based on these, the exercise protocol is modified. Return to full exercise is dependent on the degree of the injury but typically a minimum of four to six months is required. 1. Wright IM, Phillips TJ, Walmsley JP. Endoscopy of the navicular bursa; a new technique for treatment of contaminated and septic bursae. Equine Vet J 1999; 31: 5-11. 2. Smith MRW, Wright IM, and Smith RKW. Endoscopic assessment and treatment of lesions of the deep digital flexor tendon in the navicular bursae of 20 lame horses. Equine Vet J 2007; 39:18-24. 3. Cruz AM, et al. Podotrochlear Bursa Endoscopy in the Horse: A Cadaver Study. Vet Surg 2001; 30(6):539-545. 4. Rossignol F and Perrin R. Tenoscopy of the navicular bursa: Endoscopic approach and anatomy. J Equine Vet Science 2003; 23(6):258-265. 5. Smith MRW, Wright IM. Endoscopic evaluation of the navicular bursa: Observations, treatment and outcome in 92 cases with identified pathology. Equine Vet J 2012; 44: 339-345. 6. Holowinski ME, Solano M, Maranda LS, García-López JM. Magnetic Resonance Imaging of Navicular Bursa Adhesions. Vet Rad & Ultrasound 2012; 53(5): 566-572.